Social media may seem to have taken over personal communications in the United States in the past decade but a new platform is emerging as today's leader. 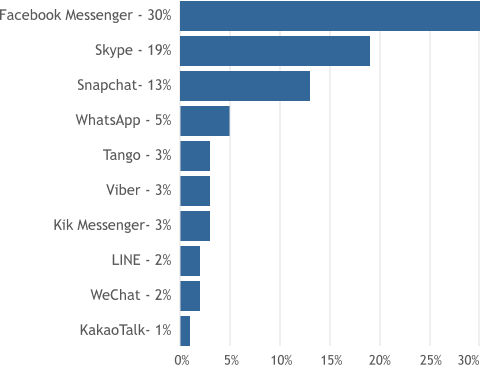 The combined power of social networks and mobile dominance is putting messenger apps at the top of many people's list of favorite ways to communicate. Exceptionally popular in other parts of the world, the adoption of messenger apps lags somewhat in the U.S. in comparison. That said, it is on the rise and with leaders Facebook and even Twitter getting in the game, you can be sure that the use of these apps is anything but a passing fad. In essence, these apps create private micro-networks via which people can communicate one-to-one or in groups. The methods of communications vary from basic text-based IMs to voice and video calls. Users of these apps tend not to be monogamous in their adoption of the tools. Instead, you can expect someone who uses Skype, for example, to also be an active user of WhatsApp or another platform as well. As to be expected, there are a wide variety of messenger apps emerging. When trying to understand who the big players are, let's take a look at the top 10 messenger apps for 2019 in the US (based on data from Statista). Description: Now its own standalone app, the Facebook Messenger App represents the largest active usership in the U.S. market. Of all such apps, it is one of the more basic in its feature set with basic chat, voice messaging and calling features. The free price tag and strong brand name no doubt go a long way toward making it one of the first such apps to be adopted by new users. Description: Another well-known name in the U.S. occupies the #2 position with about 19% of people using it. Skype has successfully leveraged its well-known voice calling leadership in marketing its messenger app. Perhaps one of its most unique features is the ability to send messages to others even when the intended recipient is not online. Text, photo and video messages can all be managed and the app also handles voice calls to mobile or landline phones. As with Facebook's messenger app, Skype offers its services for free for Skype to Skype calls, but does charge fees for calls outside of its network (for example, to a landline). Refer to our guide outlining Skype Competitors and Alternatives based on your usage patterns for more information. Description: Snapchat has successfully survived what could have been a lethal scandal due to parental concerns about inappropriate photos of teens being distributed. Today, Snapchat users account for roughly 13% of all messenger app users in the US. From within the app, you can take and edit a photo or video (including adding text and emojis) and send it directly from there. It syncs with your phone�s contact list for easy use. A twist on the original Snapchat in which photos disappeared in short order is the new Snapchat Story that can live on for up to 24 hours. A Discover network lets users search through a host of dedicated Snapchat content and share it out. You can send your photos and videos or even conduct live video chats from this free app. Description: WhatsApp has carved out a niche for itself with people who want to interact on an international level. Free for the first year, its 99-cent cost per year thereafter would hardly be a deterrent, especially as it helps the app remain free of annoying advertisements. WhatsApp also syncs with your phone's contact list and lets you send text, voice, video and phone messages. Like other apps, it requires phone service and uses your 3G, 4G or WiFi network. For more information, refer to our WhatsApp versus Viber Comparison guide. Description: Another free messenger app, Tango offers a very unique twist. In addition to allowing individual or group chats, voice calls and video calls, it is optimized for other uses. You can play games, visit chat rooms and search Spotify for music. Sharing of music, photos and other messages is easy as Tango relies on the existing phone network for operation. Description: With the Viber messenger app, messages can include text conversations, stickers, emoticons, photos and videos. Viber Out allows for outbound voice calls to be made to non-Viber users, which can incur a cost. Otherwise, this application is completely free to use. You must have a SIM card in your smartphone in order to make calls to people outside of the Viber network. See our Viber Competitors article for comparisons and more information. Description: Finding a way to differentiate in the messenger app market can be tough but may also be integral to achieving good adoption rates. Free Kik Messenger recently announced the ability to search for GIFs via emoji's to add yet another interactive element to messages. Kik Messenger also excels at facilitating cross-app communications and gives users what may well be the most robust ability to control privacy and contacts of any messenger app available. Description: This blending of a texting app and social network lets users shoot and share movies along with sending basic messages in text or video format. It has found a way to also help you organize information by date and leverages location data as well. Users can also make free voice calls from LINE. Description: WeChat's functionality lets users make free voice and video calls, engage in group chats or 1:1 IMs, and send multimedia messages. It also offers a feature whereby users can find others which is a pretty handy and fun tool. Description: Kakaotalk lets you choose a personalized theme to your user experience. It also includes stickers and emoticons in the individual or group chat features. Voice and video calls can be made for free and messages can include photos as well as location. The Kakaotalk PC app extends functionality to the desktop for users who want that. So there you have it - our take on the top 10 messenger apps for 2019. Whether or not the above apps will be on such a list at the end of 2017 remains to be seen. What is known, however, is that these types of apps will only grow in popularity and use. It should also be noted that there are some other well known apps missing from this list, such as Apple's FaceTime, and Google's Hangouts. So there are plenty of other solutions out there and new ones that are appearing as more people embrace the use of messaging apps in the US. Use our comment form below to let us know what your favorite messaging app is or if we missed one that you recommend. One thing that will be interesting to watch is how the creators of these apps will continue to make money. While usage of messenger apps go up, the revenue that they generate remains a very small portion of messaging and communication revenue overall. How or if that will change could also be an interesting trend to follow in 2019 and beyond.